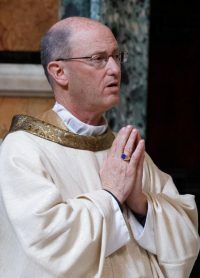 Bishop James D. Conley of Lincoln, Neb., is pictured in a 2012 photo at the Vatican. LINCOLN, Neb. (CNS) — Claims of “priest wrongdoing” have prompted the Diocese of Lincoln to make a “thorough review” of its policies and procedures for responding to abuse allegations made against its priests, said Lincoln Bishop James D. Conley. He made the comments Aug. 10 at a listening session he was invited to attend at St. Wenceslaus Church in Wahoo. At the Wahoo church, he reported that he “celebrated and preached” at all weekend Masses at St. Peter’s Parish the Aug. 5-6, and on Aug. 6 also held a listening session with 500 people at St. Peter’s. “The topic was Father Townsend’s behavior. Their message to me was clear and honest: They desire transparency and objectivity, and that is my promise to you and all the faithful in the diocese as I move forward,” Bishop Conley said. He said he has assembled a group of senior advisers to help him evaluate abuse allegations. The group includes members of his staff, officials from the Archdiocese of Omaha and a mental health expert. “This transparency and objectivity I promise you will include a thorough review of our safe environment policies and procedures by an outside investigator,” Bishop Conley said. “This investigation will include an investigation of the most recent incident involving Father Townsend, an evaluation of my staff and their response to improper behavior made against a priest, and an evaluation of my response to and readiness for sexual abuse allegations. Among other actions he has taken, he said, is presenting to the Diocesan Review Board four cases he briefly discussed in his remarks at the Wahoo church. He planned further meetings with the diocesan review board, he said. Bishop Conley said some details he could not share because of ongoing church and civil investigations, but that he would report further on the cases when the investigations were complete. He has met with Father Steve Thomlison “to discuss a past incident in the military that was a concern to me and the Diocesan Review Board.” The priest submitted his resignation as pastor of St. Stephen in Exeter and St. Wenceslaus in Milligan. “I want to make it clear that Father’s behavior did not involve an offense against a minor or a parishioner. Father received an honorable military discharge. I am committed to getting Father the care he needs. Please join me in praying for Father Thomlison,” Bishop Conley said. A fourth diocesan priest, Father James Benton, was accused in 2002 for inappropriately touching a minor on a camping trip between 1980-1982, the bishop said. That matter was fully investigated by the Lincoln Diocese. The allegations could not be substantiated. “I prohibited him from exercising public ministry in the diocese. I also restricted him from being alone with minors. He is now retired,” Bishop Conley said.